The RAF's Chief of the Air Staff, Sir Stephen Hillier. Crews from RAF Lossiemouth are due to return home in the coming days following a four-month mission in Romania helping allies guard against intruders. During that time, Typhoons from 1 Squadron and II Squadron were scrambled eight times – intercepting 20 Russian aircraft flying towards Nato airspace. 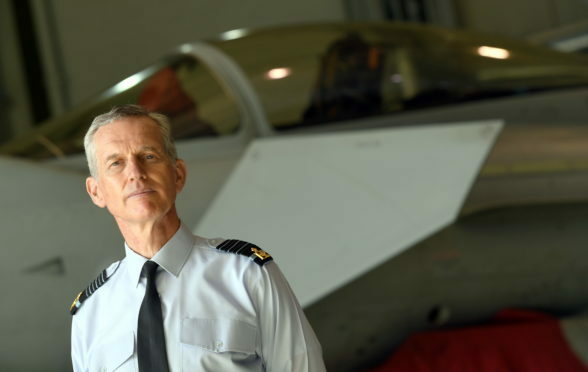 Yesterday, the Chief of the Air Staff, Sir Stephen Hillier, visited Moray to thank personnel who had been part of the mission and said their efforts had demonstrated the “collective resolve” of the allies to disturb Vladimir Putin’s plans. Sir Stephen, who is a former station commander of RAF Lossiemouth, said: “In terms of the reasons for why we saw such a high level of activity while there, you would have to ask the Russians. “Our job was to demonstrate that we are ready to respond 24/7 and that’s exactly what we have done. It takes a huge amount of effort to make that happen. “We’re an incredibly busy air force – we’ve got 16 operation underway at the moment in 23 countries – and RAF Lossiemouth is going to get busier too with a fourth Typhoon squadron and the Poseidon P-8 maritime patrol aircraft due to arrive. The Nato enhanced air policing mission in Romania requires member countries to take turns defending its eastern boundary from aggressors. Typhoons from Lossiemouth arrived on the Black Sea coast in April to team up with other RAF staff with the final personnel are due to arrive home again in the coming days. The objectives mirror the quick reaction alert (QRA) tasks performed by jets based in the north-east, which intercept unidentified aircraft approaching UK airspace. Squadron Leader Roger Cruickshank, a pilot in II Sqn, led a mission to intercept Russian planes just days after arriving in the country. He said: “We had just got the accreditation from Nato to take on the air policing mission and then two days later we were launched on a live intercept.